Lots of harvesting of summer produce is happening by all of our farmers. Beans,carrots, cabbage, potatoes and so much more. 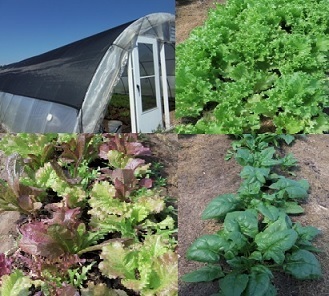 With hoop house’s season extension is used in early spring and in late fall to keep the crops warm, they also can be used in conjunction with a shade cloth a way to keep crops cooler in the summer. White Pine Farm dedicates one hoop house to summer time cool season crops like lettuce and spinach. The lettuce kept in the shade grows slower and is much less likely to get bitter like lettuce in direct sun and the wonderful spinach thrives in the shade. Apples are here Almars are no longer harvesting the early summer varieties they are now harvesting the later varieties, starting with the Paula Reds which have a longer shelf life, although they still need to be refrigerated. Almar grades their apples into two grades #1, which is close to being blemish free and #2’s which have more blemishes (these are also called weather kissed), these apples are not bruised. The apples are hand picked and the ones that don’t make either grade are than turned into a wonderful blend of cider. When making the cider they use more than one variety of apples in combinations that make wonderfully flavored cider. To add other products to the mix they make switchel, apple cider vinegar and hard cider. When the fall season is in full swing they start making apple cider donuts. Even though John Simmons from North Branch is semi retired and letting his son farm the land. He has delved into developing products from the open pollinated organic corn that he grew. 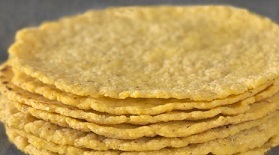 His latest new product is corn tortilla shells. Racheal Yonkman took a package home to feed to her family and gave great reviews as to how wonderful they are. It is GARLIC HARVEST TIME! The mild temperature is perfect for garlic digging. The farmers have begun to dig out the bulbs and cure them. Select varieties will be ready in about 2 weeks. The weather is staying just warm enough at night to kick tomato production in to gear! White Pine Farm and Law family Farm have several varieties available. They range from salad and slicers to bright orange and canning varieties! Many of the farms (Law Family Farm, White Pine Farm and Whetham Organic Farm) are picking beans right now! Fresh beans are nutrient rich and add a beautiful variety of colors to your meal! All beans sold here at the CSA FARMERS MARKET are hand picked carefully to be sure not to break the beans. This helps to ensure the freshest quality and taste! It takes hours to harvest the tender beans hidden beneath the leaves. 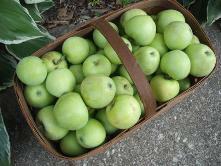 Almars Orchard apples are now being harvested. They have Lodi apples. The ones they have available are weather kissed. These summer apples have a short shelf life. In a week or so expect to see Paula Reds and possibly Jersey apples if the quality is up to Almars standards! 1. Set grill to medium, or, if using coals allow them to burn until medium heat is obtained. 2. Rub pork chops evenly with seasoning blend. Place on grill rack. 3. Brush affair amount of Maple Mustard on upward side. Cook 4-6 minutes, flip and apply to opposite side. Cook until center of the chop reaches 170 degrees, or until no longer pink. 4. 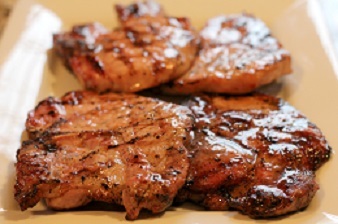 Use reserved portion of Maple Mustard to drizzle over finished Pork. 5. Serve with grilled summer squash, or BBQ Kale chips for a perfect summer meal! •	For the Vinaigrette, mix oil, lemon juice, vinegar and seasonings in small bowl with wire whisk until well blended. Stir in feta cheese and chopped beet tops. Set aside. •	For the Salad, trim squash ends. Slice into ribbons with vegetable peeler-discarding outside ribbons and core. •	To serve, place squash ribbons on each salad plate. Use tongs to place beet tops/ feta over squash. Top with tomatoes, and onions. Drizzle remaining vinaigrette over each plate. Many of the farmers are picking beans right now; Law Family Farm, White Pine Farm and Whetham Organic Farm. All beans are hand picked carefully to be sure not to break the beans. It sometimes takes hours to find the tender beans hidden behind the leaves before. Strong winds (gusting to 50 mph) blew a large limb down on our 4-wheeler and as we surveyed other damage we found that they knocked the onion plants over so we will be harvesting those and putting them on the market a little earlier than normal, once the onion plants get knocked down they do not grow larger. The walla wallas were getting to be a good size and we were going to be harvesting anyways, now you can look forward to a lot of tasty sweet onions. (White Pine Farm) Organic Certification inspector came by and was impressed with our farming operation- as well as the CSA Farmers Market operation. White Pine Farm is also serves as home base for CSA Farmers Market. Without Dales and my (Marian) tireless work the CSA Farmers Market would not exist. The other farmers do help out quite a bit, but for now, the bulk of the work rests on our shoulders. Wash and peel turnips and cucumbers. Cut or shred into matchstick pieces about 2 inches long. Sprinkle with salt and let stand 10 minutes. 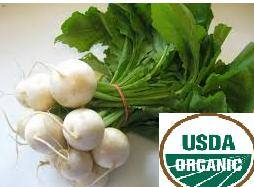 When turnip has softened, drain and squeeze out any liquid that has collected. Mix in the red pepper, sugar, vinegar, water, onion and garlic and stir thoroughly. Refrigerate before serving. Wow things are growing! I am not sure what is growing faster the weeds or the vegetables. Marianna (White Pine Farm CSA Member) and I have been trying to think of a chant we can use to tell the weeds not to grow and to let only the produce grow, but the only chant we could come up with involved hand language that said pull weeds and ignore produce. The nights have been cold (down to 46 degrees last night) so the tomatoes are very unhappy. They like the temperatures to be up in the 70’s for 24 hours each day for several days to ripen and have that maximum fresh-picked Michigan tomato flavor. We are picking only a few tomatoes. No one, except for our neighbors dog, will get tomatoes this week. The pup snuck into the hoop house, took a tomato, and came up to me wanting to play fetch!! Now we are on dog alert rather than just rabbit and deer alert. The other day strong winds gusting to 50 mph blew a large limb down on our 4-wheeler and as we surveyed other damage we found that they knocked the onion plants over so we will be harvesting those and putting them on the market a little earlier than normal, once the onion plants get knocked down they do not grow larger. The walla wallas were getting to be a good size and we were going to be harvesting anyways, you now can look forward to a lot of tasty sweet onions. On Monday our (White Pine Farm) Organic Certification inspector came by and was impressed with our farming operation as well as the CSA Farmers Market operation. White Pine Farm is also serves as home base for CSA Farmers Market and without Dales and Mine (Marian) tireless work CSA Farmers Market would not exist. The other farmers do help out quite a bit, but for now, the bulk of the work rests on our shoulders. We just got the news that there will not be enough strawberries for us this year. While all looked well on the surface, when it came time to start picking they discovered that the fruit set was just not there – a situation not obvious until you start looking closely underneath the leaves of the plant – and so there would not be enough berries to go around this year. This includes all of Ware farms outside orders and includes his wholesale accounts, not just us. As I told someone who wanted to order but wanted a guarantee that they would get berries, there is no such thing as an absolute guarantee when talking about farm harvests. There are just too many variables, and sooner or later reduced or non-existent crop harvest happens to all farmers, for one crop or another (last year many farms had no tomatoes, due to tomato blight.